We have sailors of the British East India Company to thank for popularizing the spread of punch. It’s believed that punch originated somewhere in India, but thanks to a rise in sea travel during the 1600s, the popularity of this delicious drink began to spread. Although recipes for punch tend to vary, one thing is for sure: punch is darn delicious. On September 20, be sure to break out your favorite punch bowl and celebrate National Punch Day with your favorite drink concoction. A young German adventurer named Johan Albrecht de Mandelslo penned the oldest known punch recipe. Break out your favorite punch bowl and invite some friends over. Stock up on several different ingredients so that you can customize the punch exactly to everybody's liking. Drink up! 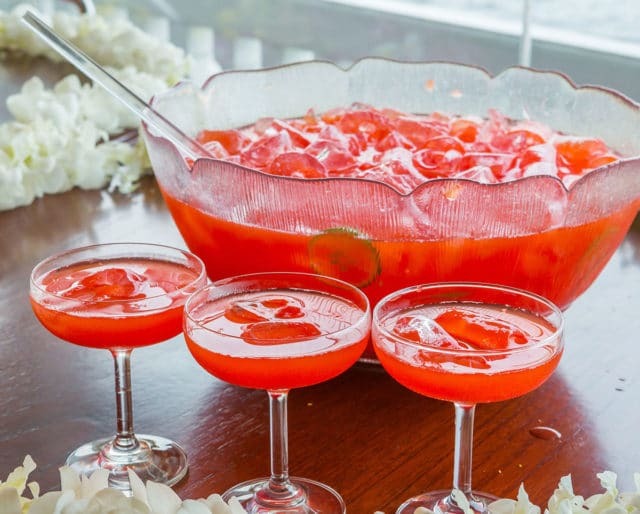 Sure, punch is almost always delicious, but there's no denying that this fun drink is even more tantalizing when it's displayed in a pretty bowl. Investing in a punch bowl is a great way to ensure that you'll be able to display beautiful drinks for family and friends. The Internet is filled with a ton of delicious punch recipes, but why not create a drink mix that is uniquely your own? Get creative by exploring with a few different ingredients. We'll kindly volunteer to be taste testers. Instead of offering bottle service, some bars are opting to simply serve up a giant bowl of boozy punch to the entire table. Courvoisier and Bompas & Parr hold the world record for the largest punch bowl ever: 4,000 liters. Sure, gulping down some water is a great way to hydrate, but sometimes plain old H2O just doesn't cut it. We don't know about you, but when we're at a party and thirst hits, looking around and finding a big punch bowl full of a delicious fruity beverage definitely hits the spot. If you're hosting a party, throwing together a quick punch is a great way to serve up a festive drink to your guests. With all of the different punch recipes that exist, you are sure to find a concoction that is sure to become a party hit. Punch is kid-friendly, but it is also an awesome drink to serve at a cocktail party. Keep it classy, or get a little wacky, as long as there is some sugar and water (and maybe some booze) involved, we're confident your punch recipe will become a crowd-pleaser.